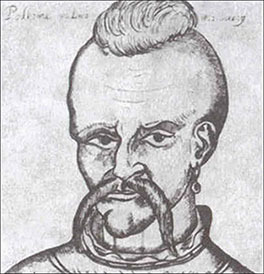 On this date in 1578, Cossack hetman Ivan Pidkova lost his head in Lviv. 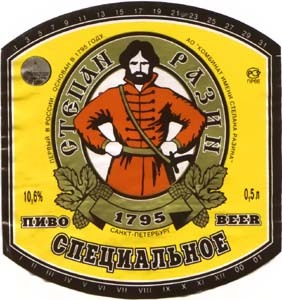 Pidkova* — the name means “horseshoe” and alludes to the horsemanship that would be de rigueur for a Cossack leader — had risen by his aptitude to leadership of the Zaporozhian Cossacks in present-day Ukraine. His death was a bid to promote himself from the steppe to power over neighboring Moldavia, and in fairness to Ivan Moldavia was worth a go. Its throne was held at that time by a new guy named Peter the Lame, and although the nickname just referred to Peter’s physical deformity, he was a creature of the Ottoman court who scarcely knew Moldavia before he became its vassal ruler in 1574. He was twice temporarily deposed before finally voluntarily resigning in 1591 so that he could retire to the comforts of Italy. The first deposition came courtesy of our man Pidkova. Claiming kinship with Peter’s late predecessor Ivan III,** Pidkova seized Iasi and proclaimed himself hospodar of Moldavia until the arrival of Ottoman reinforcements refuted the conceit. This whole border region between the Polish-Lithuanian Empire to the north and the Ottomans to the south was a perennial trouble spot. Putatively subjects of the Polish crown, the refractory Cossacks were known to raid Ottoman territory illicitly and provoke diplomatic headaches on both sides of the border. At this particular moment — 1578, that is — the Polish king Stephen Batory had only just concluded a truce with the Ottomans. As Batory had war with Russia to worry about, he was more than keen to keep his southern frontier calm; Polish troops captured the Cossack pretender and had him put to an exemplary death. 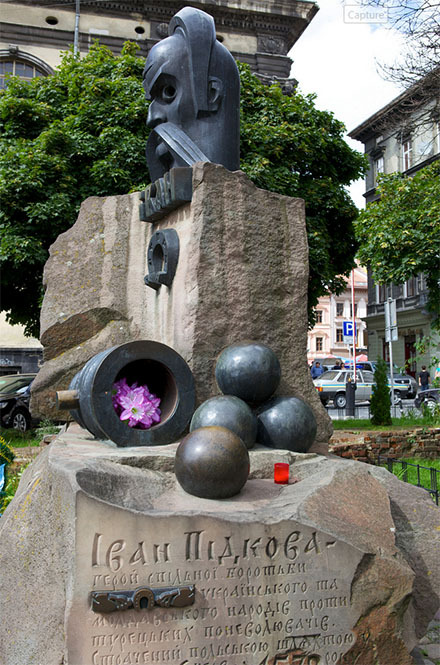 Monument to Ivan Pidkova in present-day Lviv. Image (c) stacy2005ua, a prolific photographer of Lviv’s environs whose work can be enjoyed at FaceAndHeart.com or on Flickr, and used with permission. Is grave-mounds on the plain! Of freedom’s fate we hear. May briefly bathe in flowers. That groans and howls with might. It floods the mighty Danube’s mouth. Within our barks! The waves are wild. The stream with ships was roiled. As waves beneath them boiled. They saw no land, no sky. Where exploits may be wrought. Brave lads beyond all doubt! They roared in chorus back. “I thank you, lads!” He donned his cap. And gazed upon the sea. * Or Ioan Potcoava, as Ivan came from Romanian stock. ** Moldavia’s own “Ivan the Terrible” — no relation to his Russian contemporary, of course. 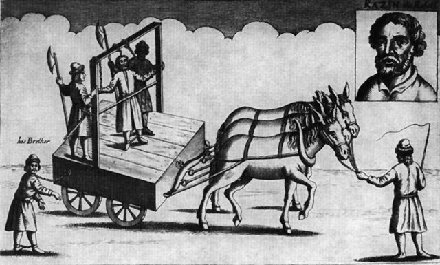 On this date in 1597, Cossack Severyn Nalyvaiko was publicly quartered in Warsaw. The Poles outmuscled him, and here he is. However, because longer-term historical trends were not so favorable to the Polish-Lithuanian Commonwealth, Nalyvaiko rates a place as an early independence martyr for (east) Slavic resistance to Warsaw’s Polish imperialism. 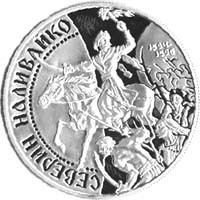 Not only does he get a spot on present-day Ukrainian coinage (as pictured); 19th century Russian poet Kondraty Ryleyev, who would himself be executed for his part in the Decembrist plot, lyricized Nalyvaiko’s death as heroic national sacrifice … and simultaneously elevated the poet’s own prophesied fate for himself. All would I take upon my soul. This, this alone, is heaven for me! Now all is vanished like a dream. Seize us, and tear our limbs away. Sickens for love of liberty. And at the tyrant aim the blow. When none for liberty have bled? My death, to me such end is sweet. On this date in 1775, the Russian Empress Catherine the Great had Cossack rebel Yemelyan Pugachev chopped to pieces in Moscow for sustaining a major insurrection whose effects would haunt Russia for decades to come. 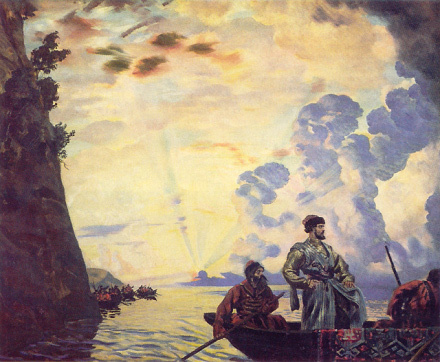 Pugachev’s Judgment, by Vasily Perov. Pugachev’s Rebellion was the most spectacular specimen in populous family tree of 18th century peasant uprisings. Most such disturbances were local and fundamentally unthreatening. Pugachev’s was neither. The Cossack commander raised a revolt in the Urals in 1773, styling himself the long-lost tsar Catherine had overthrown a decade before. We bestow on all those who formerly were peasants and in subjugation to the landowners, along with Our monarchic and paternal compassion … tenure of the land and the forests and the hay meadows and the fisheries and the salt lakes, without purchase and without obrok, and we liberate all the aforementioned from the villainous nobles and from the bribe takers in the city–the officials who imposed taxes and other burdens on the peasants and the whole people … [T]hose who formerly were nobles living on estates are enemies to Our power and disrupters of the empire and oppressors of the peasantry, and they should be caught, executed and hanged, they should be treated just as they, who have no Christianity, dealt with you peasants. The insurrection speedily metastasized, and by the time a force sufficient to quash it was deployed, it had stretched itself from the Urals to the Volga. Alexander Pushkin used the story of Pugachev’s rebellion for The Captain’s Daughter (text in English | Russian), which has been adapted to film several times — most recently in 2000. Catherine the Great, for her part, was deeply shaken by the affair, and the “enlightened despot”, while maintaining traffic with the era’s liberal intellectual ferment, decisively turned against any reform to serfdom. Catherine’s choice, reinforced by her successors, to uphold their security with nothing but repression maintained Russian serfdom until 1861 on a staggering scale — an anchor dragging down the economy just as industrializing western Europe opened a development gap whose effects persist to this day. 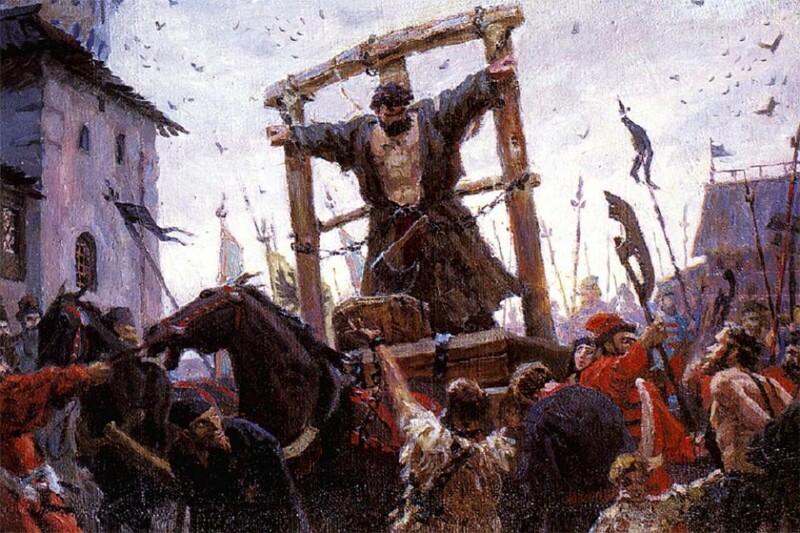 On this date in 1635, Cossack commander Ivan Sulyma was put to death in Warsaw for razing the Kodak Fortress on the Dnieper River. 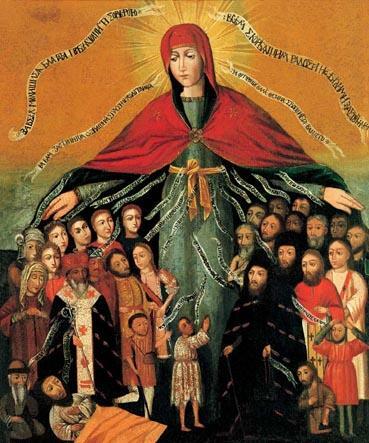 Sulyma‘s death, a footnote historically, unfolded in the rising action of Zaporozhian Cossacks‘ conflict with the Polish-Lithuanian empire then at the peak of its power. Those famed corsairs of the steppes made their way in the world by plunder. The European powers at play around the Black Sea domains of the Zaporozhian host — Poland, Russia and the Ottoman Empire — each struggled to exploit Cossack raiders for their own ends of statecraft. It was perhaps the misfortune of Poland to claim suzerainty during this unruly horde’s upswinging arc. The Poles endeavored to gather the Cossacks into the formal apparatus of the state, “registering” an elite corps of Cossacks inducted into the armed forces while reducing the remainder to peasantry. The registry’s size and privileges became a permanent bone of contention, driving a cycle of uprisings through the 1620’s and 30’s that sapped Cossacks’ loyalty to the Polish crown. Sulyma was a partisan of the militant unregistered Cossacks, fresh from war against the Ottomans. He returned to find that Poland had thrown up a fortress controlling the Dnieper, with an eye both to checking Cossack provocations against the now-peacable Turks, and to controlling internal Cossack disturbances. [E]ach successive uprising reflected the growing strength and military sophistication of the rebels. Their numbers grew, their tactics improved, and Cossack identification with the plight of the peasantry and the defense of Orthodoxy deepened. The decade-long Golden Peace merely masked a problem that was waiting to explode again. It exploded in 1648. Where Sulyma had failed, Bohdan Khmelnytsky would succeed — breaking the Cossack lands permanently free of Poland. Remembered to the modern state of Ukraine as a father of the country, Khmelnytsky’s immediate achievement was to rearrange the balance of power in Eastern Europe. Poland, ravaged by invading Swedes just as the Cossacks slipped away, fell into permanent decline — leaving a vacuum filled by Russia, which soon pulled the Cossacks into its orbit.